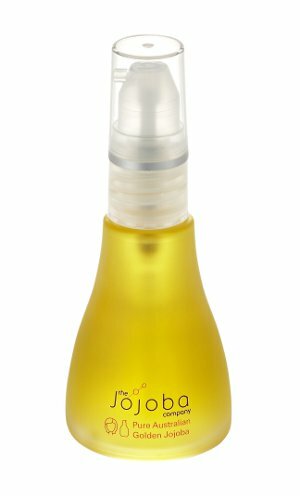 Fact: Did you know that jojoba oil is not an oil but rather a liquid wax ester and it has the same properties as skin's natural sebum so is the perfect natural moisturiser for young supple skin? I've always been a fan of using jojoba (pronounced ho-ho-ba) oil having used it as a base oil for my rosehip oil mixes for anti-ageing and healing properties and to apply directly to skin to keep scaly and dehydrated skin moist and supple. 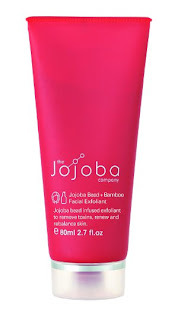 Now when I heard about The Jojoba Company, an Australian company who have based an entire skincare range for the face and body from cleansers to serums on jojoba oil, I know I wanted to find out more about them and their products. Australian owned and made natural skin care range based entirely on the qualities of pure Australian golden jojoba. Philosophy of producing sustainable products that are environmentally green and has doesnt' leave a carbon footprint or harm any cute bunnies or mice with its no animal testing policy. All products are made from organically grown jojoba in the Riverina district in south-western New South Wales. The company gently cold presses the plants to yield the glorious golden jojoba ester which contain antibiotic, anti-inflammatory, hypo-allergenic, analgesic properites and powerful antioxidants, Omega 6 and 9 fatty acids and vitamins A, D and E.
It was very fortunate that the company was generous enough to send me some full and sample-sized products to road-test, and I've been diligently putting them to work for the past 3 weeks. So now the results are in, and here's the low-down. This looks like a serious skincare contender on the bathroom shelf with the glorious luxe red packaging and silver trim lid that I'm totally smitten with. Although foaming, this isn't the frothy lather that you get from cream cleansers, instead its gentle lathering actions will leave your skin feeling refreshed and soft, and gives a velvety softening feel thanks to the aloe vera extract without any tight feelings at all. has a citrusy orange scent thanks to the grapefruit seed oil and with calendula, bilberry extract and vitamin e and B5, skin is soothed and nourished during the wash while the jojoba rich formula balance excess oil and help unclog pores. Great for normal to oily skin types. In a nutshell: my go-to face wash during the evening when I want to add moisture back into skin after a long day and stripping it of moisture from taking off all the makeup. A gritty texture clay based exfoliant that can double up as a mask for some intense rejuvenation. As a daily exfoliant, I found the jojoba exfoliating beads or bamboo powder (not sure which of the 2 it's due to) not to be as fine as other exfoliants I'm used to (eg. Grown's facial exfoliant). As a mask, it works a treat while the clay draws out impurities, detoxify and absorbs excess oil while the jojoba and shea butter hydrates and nourish. It also contains enzymes of papaya and melon fruit extract to chemically exfoliate and speed up the cell renewal process. leaves face cleansed, flake free and skintone more even and radiant free with regular use. Although suitable for all skin types, sensitive skins need to avoid rubbing to hard so as to not over-abrase the skin. In a nutshell: I prefer this as a weekly mask treatment than a daily exfoliant as I like my exfoliating beads to be super fine grained. Light, almost lotion like in texture, this cream just sinks straight into skin to keep it hydrated and supple for hours on end. With a gentle rose scent, there's no greasy feeling here either after it's absorb, just a slight sheen on the face that look like its radiating a healthy glow. Contains anti-oxidant rich ginseng root powder, green tea powder, olive leaf extract and silk amino acids to protect and restore moisture back into skin in our dry harsh climate. In a nutshell: a light, non-greasy hydrating moisturiser that gives all day protection from free radicals while giving enough moisture to calm and sooth dry sensitive skin. In my 7 day sample, I found my skin plump, velvety soft and silky after use, readily absorbed into skin looks smooth and even and well hydrated. 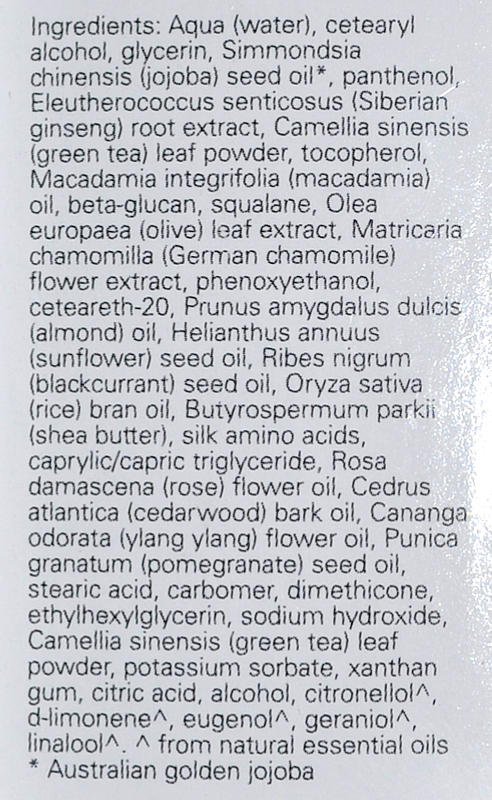 I'm amazed that despite a majority of the ingredients being nourishing oils and butter, there is not even a hint of grease or oil after using this delightful cream. Also contains marine collagen, CoQ10, wild yam, and hyaluronic acid to plump up the moisture level and boost the cell renewal process and the beta glucan will do its best to reduce the depth and serverity of fine lines and wrinkles. Also works amazing well on the eye area and did I mention that light rose scent - I'm a sucker for that rose scent that is both calming and tantalising to my senses. In a nutshell: a truly luxurious cream that packs as much punch as serums in terms of rejuvenating and renewal properties. 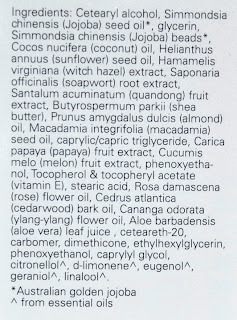 Aqua (water), Simmondsia chinensis (jojoba) seed oil, cetearyl alcohol, glycerin, stearic acid, Butyrospermum parkii (shea) butter, Ceteareth-20, sodium hyaluronate , tocopherol (vitamin E), Theobroma cacao (cocoa) seed butter, Citrullus vulgaris (watermelon) seed oil, Camellia sinensis (green tea) leaf extract, Dioscorea villosa (wild yam) root extract, ubiquinone (CoQ10), retinyl palmitate (vitamin A), panthenol (vitamin B5), Rosa damascena (rose maroc) flower oil, hydrolyzed collagen, beta-glucan, Chondrus crispus powder, xanthan gum, butylene, glycol, phenoxyethanol, ethylhexylglycerin, 1,2-Hexanediol, caprylyl glycol, benzoic acid, sodium benzoate, potassium sorbate, citric acid, alcohol, eugenol, geraniol, citral. An anti-inflamatory and anti-oxidant balmy gel, this is the kind of stuff you want to slap on your face if you've had a bit too much sun and need to cool it down and restore moisture to it while. It's also good for days when your skin is just acting up when the texture is dry and flakey and just going errghh! Containing soothing cucumber , aloe vera, green tea and lavender and peppermint essential oils, this stuff has some great line up of botanicals to care for stressed skin. It could also work as a great leave-in gel mask by applying a thick layer and leave on skin for 15 minutes, then rubbing the product in and wiping any excess off with a tissue for deeply hydrated and soothed skin. In a nutshell: for skin that needs quick TLC, this botannical intensive balm (or gel as I tend to think balms are sticky and thick in texture) will leave you feeling soothed of irritations. 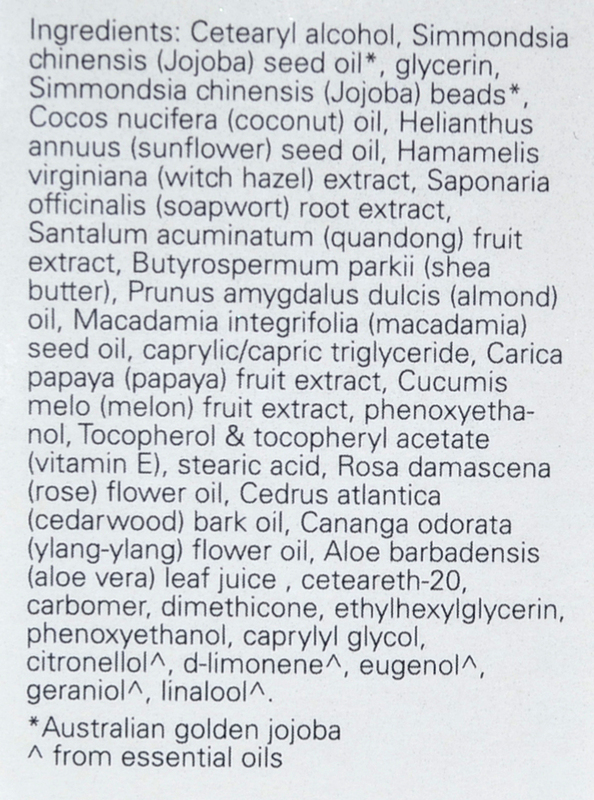 Aqua (water), glycerin, Chamomilla recutita (German chamomile) flower extract, Portulaca oleracea (portulaca) extract, Camellia sinensis (green tea) leaf powder, Aloe barbadensis (aloe vera) leaf juice, tocopherol (vitamin E), Cucumis sativus (cucumber) oil, Simmondsia chinensis (jojoba) seed oil, Hippophae rhamnoides (seabuckthorn) oil, Punica granatum (pomegranate) seed oil, Lavandula angustifolia (lavender) oil, Mentha piperita (peppermint) oil, Chamomilla recutita (German chamomile) flower oil, carbomer, ethylhexylglycerin, phenoxyethanol, alcohol, potassium sorbate, xanthan gum, sodium hydroxide, citric acid, disodium EDTA. 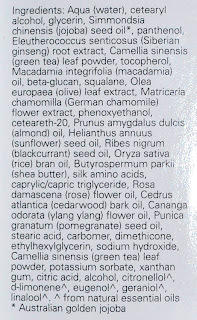 I've used my fair share of pure jojoba oil but this would have to be the cream of the crop in terms of organic jojoba oil. You'll notice the slight nutty scent that just reminds you of how fresh the contents in the bottle is. Being closest in properties to skin's own nature oil, I use this neat, as a cuticle oil to keep those ragged rough edges at bay, on my scaly legs for all seasons but would also add this to my next rosehip oil mix to restore moisture and maintain skin's elasticity. Having tried these hero products, I can give The Jojoba Company 2 thumbs up for coming up with products that are well suited to our dry harsh climates but don't compromise on great texture and is non-greasy or sticky which puts them squarely on the must-try category in my books. The Jojoba Company has done a fabulous job to come up with such a comprehensive range and you can use their skin compatibility chart to see which product suits your skin type. 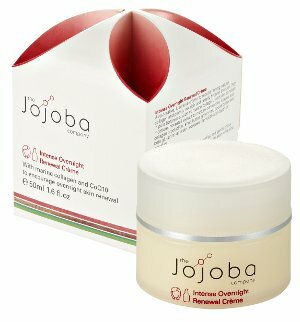 The Jojoba Company product range is available at all good health shops and selected pharmacies. Check here to find your nearest stocklist. Products featured in this post were provided for consideration. I recently tried their Skin Refining & Brightening Face Masque and now cannot wait to try this!